Whether you need repairs to your shoreline from erosion, protection from continuous wave action, or winter ice heave (Ice Jacking), we are ready to meet your needs at your waterfront property. Rolling hills, steep slopes, erosion control, all using natural boulder wall construction to provide you a more level solution to your outdoor spaces. Natural stone boulders and rock add timeless beauty to your property. We use natural solutions to meet your landscaping needs. We can integrate beautiful landscape solutions into your property with or without retaining walls, or shoreline needs. Navigation at the top of each page, and at the lower left part of each page will provide you with information and photos about our services, details about our company, where we work, and where we are located in northern Minnesota. We look forward to the opportunitiy of assisting you with any of your boulder wall, landscape and/or shoreline repair needs. 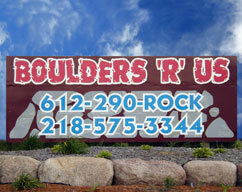 BOULDERS'R'US was established in 1988 on the principles of delivering a high quality product for a fair price. We look forward to meeting you regarding your Shoreline, Boulder Wall and Landscaping needs, and Thank-You for taking the time to visit our site!